One of the things teachers ask students to do is to reflect on their learning. Sometimes that reflection happens at the end of a project or a unit of study or the course but teachers know that reflection is a key part of the learning cycle. It often looks like this in real life: pre-assessment…set goals for learning…instruction and practice…assessment of learning… and reflection. Now this process is not just one found in education. It is found in lots of places but with different terms like debriefing, project review, grading of product implementation, evaluation of programs, examination of business goals…or a number of other terms, but in the end, all of these are forms of reflection. 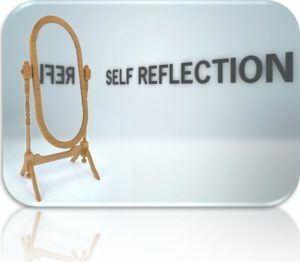 According to my paraphrased Webster’s definition, reflection is serious thought about a topic, event or project that is written down or otherwise recorded/documented. As important as reflection is, teachers may be the ones who practice it the most poorly. That is usually because they do not do it. Teachers are either feeling the pressure to move on to the next thing, or they are so tired by the end of the school year, that their only plan is a series of long naps alternating with “umbrella” drinks on a beach. However, before both of these well-deserved things take place, I would strongly encourage all educators—teachers, counselors, and administrators—to spend some time in reflection. Doing so will allow you to grow and be even better in your work. Additionally, if I could be so bold, I would like to suggest a few questions that you might use in this process. While the questions are important, the actual process and time spent on it is the key. In addition, you do need to write the answers down…though complete sentences are not required. 7. How I am I better now than I was a year ago? How can I build on this? 8. How have my ideas about my work changed over the last year? 9. What do I need help with to be better at or continue to grow at my craft? 10. What person(s) made a positive impact on me in my last year of work? Have I thanked them?